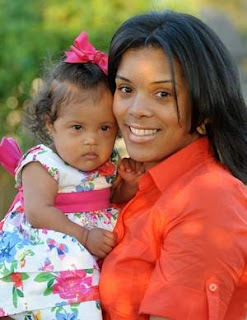 When Jessica DuBois found out 10 months ago that her newborn daughter, Glee, had Down Syndrome, she was in shock. But since then, she said her eyes have been open to a whole new world — a new way of thinking, a new way of love and acceptance, and a new way of advocacy. When she first would bring up Down Syndrome among family and friends, she said, she would only hear negative things. But DuBois, 26, has turned them all into positives, to the point where she tells loved ones not to be sorry and that it’s not a bad thing. According to Down Syndrome Association of Delaware, one in every 691 babies in the nation is born with the condition, which gives an individual a full or partial extra copy of chromosome 21, which alters the course of one’s development. There are more than 400,000 people in the country living with Down Syndrome. While there is no cure for the condition, DuBois and fellow members of the Down Syndrome community want the public to be more accepting. As a way to help spread awareness of Down Syndrome, DuBois and her cousin, Robin Wright, a local Zumba instructor, will host a Zumbathon fundraiser at the Sussex County YMCA, which will take place Sunday, May 5. Wright will be one of eight local Zumba instructors who are expected to participate in the event. DuBois said she hopes it will become an annual event to help spread the word about the disorder, and so far, it has been well-received by local businesses. Door prizes, raffles and a silent auction will take place, as well as two hours of nonstop high energy dancing. In addition to teaching Zumba classes, Wright works at Lotus Blossom Learning Center in Lewes, where two of her daycare children have Down Syndrome. “We know now that therapy and intervention is most important for these kids to strive and go mainstream and be in normal classes,” she said. While the event will be free, donations will be accepted at the door. All proceeds will go toward The Bumble Glee Hive, Glee’s team for the 10th annual DSA Buddy Walk. DuBois and her daughter have taken part in two buddy walks already, and they’re eagerly anticipating the Delaware walk May 19 in Newark. The walks have been a boon of support for DuBois and Glee. Each time, they’ve had more than 25 supporters join them, including family members from Philadelphia that DuBois hadn’t seen in years.